Brooklyn is about as wonderful, uplifting and magical as romantic cinema gets. Led by outstanding work from Saoirse Ronan, the film achieves the rarest of goals by creating genuine characters with big life decisions ahead of them without ever over dramatizing itself or creating stakes bigger than it needs. It would've been painstakingly easy to add a little more family drama or give Eilis a more serious reason to remain in Ireland, but that would've forced Brooklyn into a place it didn't want to be. Instead this remains a personal and heartfelt tale of one person forced to choose between two separate lives when things finally start going her way. Once you get past that awful "Two Countries, Two Loves, One Heart" tagline that the film promoted so heavily, you aren't pushed into an overly lovey-dovey film all about which boy a girl is going to fall for. Instead you get an interesting and deeply moving story about a young woman who has to choose which life is better for her, not just which boy she fancies more. On paper, this may sound like essentially any old romance film with a drop of culture added in, but with its emotional script, winning performances and subtly beautiful scenery, Brooklyn becomes something quite special indeed. At the heart of all of this is Ronan, who is finally given a role that allows her wonderful acting abilities to shine. She is mesmerising as Eilis, so much so that even one of the film's earliest sequences - Eilis waving goodbye to her family from the ferry - is a truly affectionate moment. Thanks to Ronan's performance (and Nick Hornby's script), Eilis becomes a character we are deeply protective over. She grows from a frightened girl into a mature and driven young woman, and its a journey that is so beautifully told that it becomes a real pleasure to enjoy. Ronan's supporting cast are all impressive too, notably Julie Walters as the stern but hilarious landlady of Eilis' boarding home in Brooklyn, but Domnhall Gleeson is frustratingly not given a great deal to do, especially in comparison with Emory Cohen. Cohen, as Eilis' boyfriend Tony in Brooklyn, does a fine job of simply being a really likable character. There's never any doubt that he will hurt or betray her, it's a nice change from the more stereotypical romance genre conventions. Cohen is deft in how he handles Tony's emotional sequences, and it strengthens his character a great deal. In the end, thanks to these performances, it becomes very easy to long for Eilis to choose Brooklyn as her home. Brooklyn's almost pastel infused colour scheming allows the whole film to look gorgeous, but most of the beauty here comes from the script. Hornby's adaptation is tasked with crafting genuine emotional connections between a variety of characters, but it also has to do so without ever feeling corny or overplayed. The stakes in Brooklyn are ultimately very small, and so an overly dramatic script would push the film into melodrama territory, but Hornby does his job extremely well. Emotional bonds are formed between Eilis and Tony very quickly, but it doesn't feel phony due to the number of connections that Hornby finds for other people too. Through just one scene in the opening act we feel the strength of Eilis and her sister's relationship, and in one devastatingly emotional sequence in the film's middle half we come to truly know how much Eilis cares for her mother, and it all strengthens Eilis and Tony's relationship well. You never get the impression that her life revolves around him, nor that his life revolves around her, and this just fleshes them out further and makes them considerably more interesting people to watch grow. That they're performed with the caliber that they are is just the icing on the cake, really. Brooklyn's main issue, though, is how different its second half feels to its first. Whilst there are strong thematic bonds tying the two halves together, once Eilis returns to Ireland the film loses some of its magic. It's entirely possible that this is an intentional move to really enforce the differences between the two countries, but for us to fully believe that Eilis would consider staying in Ireland to live her life the second half of the film needed to benefit from the same strengths as the first half, and it doesn't really. It's still wonderfully performed and beautifully shot, but the script doesn't form as many emotional bonds in Ireland as it does in Brooklyn, and it forces the second hour to feel considerably longer than the first. This is rectified, though, during the film's climax in which the emotional stakes are perfectly balanced and the film's characters all come into their own. Unlike the characters from Spotlight, Eilis is granted one big, character defining moment in the final act, but Ronan handles it with ease. The moment is quiet, it is filled with opportunity and it just deepens our admiration for a lovable character even further. And in the end, that's all Brooklyn was ever about. 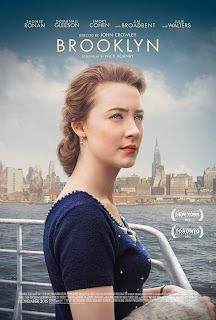 To Summarise: Featuring fantastic work from Saoirse Ronan and Emory Cohen, Brooklyn is a compelling and deeply moving romance picture with a deftly beautiful script to match its quietly stunning scenery.